In this construction video tutorial, Mr. S.L. 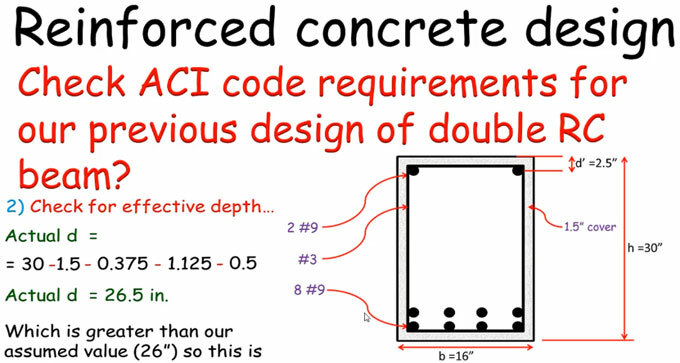 Khan, the eminent engineer, will show you how to check the design that is undertaken for a double reinforced concrete beam with compression and tension zone by following ACI code requirements of beam. In compression zone and tension zone there are steel bars. The beam breadth orbit is 16 inches and diameter is 2.5 inches and overall height and depth of the beam is taken as 30 inches. There are 8 numbers 9 steel bars in tension zone and in compression 2 numbers 9 steel bars. There are 3 numbers stirrups and concrete cover is 1.5 inches. Now, you have to verify that whether this beam or design is perfect or not. For this purpose, you have to examine the ACI code requirements for the specified beam (beam width). Specifically verify minimum width of 4 numbers 9 bars for both layers. a. Beam is reinforced adjacent to the tensile face. g. Concrete has restriction to withstand the total compression, hence additional reinforcement is necessary..